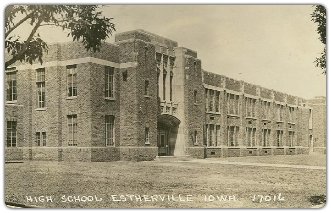 First settled in 1856, Estherville was incorporated as a city in 1881. The City is named after Esther Ridley, wife of Estherville's founder Robert Ridley. The population of the area consisted of immigrants from Scandinavian countries as well as Germany and Ireland. Estherville is the county seat of Emmet County, which is named after Irish leader Robert Emmet. 1856 - there appears to have been some settlement in the county, but it was not until the summer of 1857 that settlers arrived on the site of Estherville. Until 1859, when Estherville was selected as the county seat, free lots were given to anyone who would erect dwellings on them. 1860 - the county population hit 105, with the majority living in Estherville. 1861 - In the county's first presidential election, Abraham Lincoln received every vote. 1870 - The establishment of the newspaper, however, was perhaps the most far-reaching event, for it put into print a word that was to perplex etymologist years later. The word was "blizzard". An old Anglo-Saxon term, its first use to denote a heavy snow storm accompanied by a violent wind and extreme cold is often credited to O. C. Bates, editor of the Vindicator. Another version is that Bates adopted the word from "Lightening" Ellis, one of the town characters who congregated in the newspaper office. Whatever the source, "blizzard" in its present usage apparently was employed for the first time in print on April 23, 1870, in an issue of the Vindicator. 1870 - There was a heavy immigration to this community from the Scandinavian countries, Germany and Ireland. The county was named for the Irish leader Robert Emmet. May 10, 1879, a meteor fell north of Estherville. Weighing 437 pounds and measuring 27 x 22-3/4x 15 inches, its surface was broken with a metallic glitter. Specimens of this meteor are on display in the Estherville Public Library and Chamber of Commerce. 1881 - A population of 800 found Estherville incorporated under the aldermanic form. The loyal county ex-treasurer, Dr. E. H. Ballard, was elected mayor. 1884 - the first courthouse of brick was built at a cost slightly under $12,000 on the north half of the Public Square which was deeded to the county by the city. 1892 - the population had increased 2,185, and the following year Estherville was incorporated as a city of the second class. 1895 - a municipal water works and electrification of the town inaugurated its modern era. 1882 - a public library was established and in 1903 a Carnegie library was built on the south block of the city park. 1) Carnegie Library - Located in the heart of downtown Estherville, this historic building is over 100 years old. Enjoy the beauty of the architecture, monuments, and green space in the surrounding square. 2) Peterson Point Historical Farmstead - The Peterson family homsteaded this farm on High Lake in 1866 and lived there for many years. The farmstead has been placed on the National Register of Historic Places which includes a restored farmhouse, barn, and various outbuildings. The Emmet County Conservation Foundation holds several annual celebrations at the farm. At other times, reservations are required for a guided tour of the house and farmstead. 3) Emmet County Historical Museum - houses a rich collection of the history of Emmet County with photographs and artifacts. The complex includes an actual country school building, cabin and machine shed. Open: 2-5pm June through August. 4) World War One Monument - a project of the War Mothers, now known as the Service Star Legion Organization, the monument was constructed in 1938 and restored in 2005. It sits in Library Square and commemorates soldiers from the Emmet County area who fought in World War I. 5) Estherville Rock Garden - built in 1933, the Rock Garden was constructed to be a beautiful area in which to relax by the river. Stones from various towns were brought in to build the masterpiece. The garden was restored in 1996 after flooding damaged much of the area.